The Smoked Haddock Salad was created by chance to complement a colourful mid-week meal with two beautiful friends, the wonderful Chris, a loved fellow Cardiffian, whose company I have been enjoying so much lately (yey!! ), and the beautiful Katerina who is brightening up our week with her express visit from Greece- ex Cardiffian (but always one at heart). This fish salad tastes even better the day after when its simple flavours have infused the haddock overnight in the fridge. The recipe was inspired by 300gr of smoked haddock that needed to be cooked on the day, our need for a light salad, and a quick google search for haddock salad recipes, of which eventually I followed none but one of which gave me the mustard vinaigrette idea. It takes 15-10 minutes to makes and can be enjoyed warm too! Add the chopped fine green beans in a flat, large shallow pan with 1/3 of it filled with boiling water. Simmer for five minutes, remove and drain. Keep the water boiling in the same pan. Add the whole fillets of smoked haddock and steam/simmer for ten minutes. Add a bit more boiling water if necessary. Prepare the vinaigrette by mixing in a jar the mustard, salt, cider vinegar and olive oil. Use as much olive oil as you think you need but at least five Tbsp. Shake the jar vigorously until the vinaigrette has a loose but creamy consistency. Adjust seasoning to taste. Remove the haddock and drain. Add haddock to a shallow salad bowl and flake roughly with a fork. Add the chopped parsley, beans and onion. Dress with the vinaigrette and mix well. Enjoy as a light lunch or dinner for two on salad leaves or toasted rye bread , or as a light side dish. 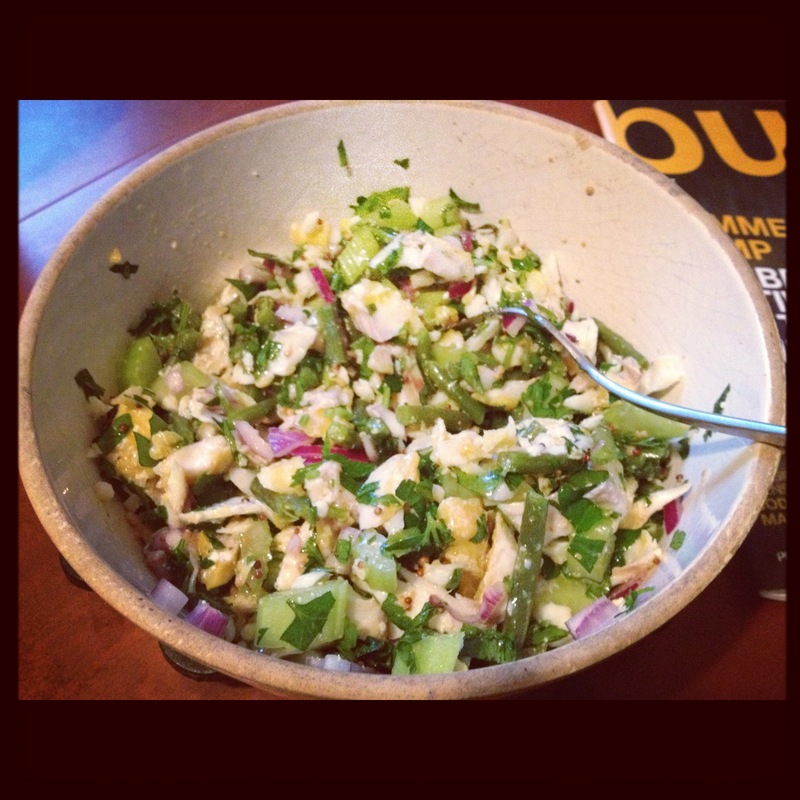 This entry was posted in gluten free, Recipes and tagged celery, fine green beans, food, food photography n, mustard vinaigrette, parsley, recipe, smoked haddock salad.